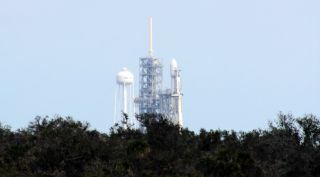 The SpaceX Falcon Heavy on Launch Complex 39A as seen from the KSC Press Site Feb. 5. WASHINGTON — SpaceX has won its first big-ticket classified military launch contract for the Falcon Heavy rocket. The Air Force awarded SpaceX a $130 million contract for the launch of Air Force Space Command (AFSPC)-52 satellite. The Falcon Heavy beat United Launch Alliance's Delta 4 in a competition under the Evolved Expendable Launch Vehicle program. The launch will take place at Kennedy Space Center, Florida. This is the fifth competitive procurement under the current Phase 1A of the EELV program since SpaceX entered the market to challenge ULA. The $130 million award for the Falcon Heavy launch is considerably lower than the average $350 million price tag for Delta 4 launches. AFSPC-52 is a classified mission projected to launch in late Fiscal Year 2020. SpaceX President and Chief Operating Officer Gwynne Shotwell said in a statement that the company is “honored by the Air Force’s selection of Falcon Heavy to launch the competitively-awarded AFSPC-52 mission.” She said the contract award indicates the military’s “trust and confidence” in the company. Falcon Heavy also in on track to launch the U.S. Air Force’s STP-2 technology demonstration mission, currently scheduled for October. The Air Force released the solicitation of the AFSPC-52 mission September 28 and proposals were due October 30. During a meeting with reporters at the Pentagon on Thursday, Lt. Gen. Arnold Bunch Jr., the military deputy for the Office of the Assistant Secretary of the Air Force for Acquisition, said he was confident that the cost of military launches will continue on a downward path. "You have to watch what we’ve done. We’ve saved money over time," Bunch said. "That's driven some by what we’re doing with competition and also by the commercial demand signal. The two are coupled together."